Nighttime photography is something that a lot of photographers enjoy; I certainly do, along with countless others. Modern cameras can capture more detail at night than we can see with our naked eyes, revealing entire worlds that couldn’t exist otherwise. However, more than almost any other genre, night photography also challenges your camera equipment to its most extreme. In this article, I will go through some of the top lenses for Nikon cameras if you want to take pictures at night, including information about their low-light performance and depth of field. I cover more than 20 lenses in this article, so it’s pretty extensive – hopefully, you’ll learn something new about the equipment you need in order to capture good star and nighttime landscape photos. This list doesn’t cover every lens made, and there certainly are some gaps in the lineup below. (For example, I don’t cover any lenses longer than 35mm, but some people like using longer focal lengths to stitch nighttime panoramas.) On balance, though, this does cover most of today’s common nighttime photography lenses. These lenses are described assuming that you want sharp stars, without any star trails. That means that wide-angle lenses (which let you use longer shutter speeds without visible star movement) have priority. The ISO score for each lens takes into account both its maximum aperture and the longest shutter speed you can use without getting significant star trails. Note: Before reading this article, in order to understand the “ISO score” and “full-frame equivalent ISO score” rankings, you’ll want to read my earlier article, which provides an explanation of what makes a good night photography lens. That article explains exactly how I find the ISO values listed in the sections below, and it’s also useful if you aren’t familiar with topics like coma or crop-sensor ISO performance. I found the depth of field values by looking at the Photo Pills calculator for each of these lenses, using a circle of confusion value of 0.03 mm. Nikon’s FX cameras – and the full-frame cameras of other brands – are arguably the best tools on the market for nighttime landscape photography. Their sensors perform very well at high ISO values, and, more importantly, they offer a huge lineup of lenses that work well at night. The lenses below are measured in terms of the ISO that they will allow you to use and still capture sharp star photos. Just like on your camera, a lower ISO value in this ranking system is better, since you’ll end up with less noise/grain in your images. Again, more information is available in our other nighttime photography lens article. This lens is well-known for its nighttime performance. Shoot at f/2.8 and 14mm, and you’ll be able to get some very interesting shots. There is no perfect nighttime photography lens, and the 14-24mm is a case in point. For example, f/2.8 is not the ideal aperture for nighttime photography. Something like f/2.0 allows in twice as much light, letting you use an ISO that is significantly lower. On the other hand, 14mm and f/2.8 is just about the ideal intersection of ISO performance and depth of field. Sure, other lenses have a wider aperture, but this one can render a sharp image from 1.16 meters (3.8 feet) to the stars in a single photo. At night, that’s incredibly useful. With other lenses, if you want a large depth of field, you’ll need to focus stack – not something that is easy, or sometimes even possible, when it’s dark. It doesn’t hurt that Nikon’s 14-24mm f/2.8 is also good for normal landscapes. It is quite sharp, even at f/2.8 in the corners, and is almost entirely free from coma. However, it’s not perfect. This lens has very high levels of flare, appearing prominently when the moon is in your frame. Plus, the 14-24mm f/2.8 is heavy and expensive (though decent on the used market), deterring many potential buyers. If you’re willing to spring for it, though, this is one of the most balanced nighttime photography lenses you can buy. By most accounts (including our own review) the Tamron 15-30mm f/2.8 lens is on par with the Nikon 14-24mm f/2.8 in optical quality, if not slightly better. Specifically, the Tamron has less flare than the Nikon, while being even a bit sharper in the corners at wide aperture values – something that is particularly useful for nighttime photography. Because their specifications are nearly the same, the Tamron and the Nikon require essentially identical ISO values for a proper exposure at night. Although the Nikon has a bit more depth of field, the two are so close that you’ll barely notice a difference. The main negative of the Tamron is its weight. At 1100 grams, it’s even heavier than the Nikon, making it one of the heaviest ultra-wide lens for Nikon cameras on the market. It’s also not quite as wide as the Nikon; 14mm gives you noticeably more coverage than 15mm. Of course, in exchange, you’ll get the additional range from 25mm to 30mm, which the Nikon does not offer. The Tamron’s retail price is $800 cheaper than the Nikon 14-24mm. For most photographers (unless you already own the Nikon), it’s the better choice. Another similar lens is the Tokina 16-28mm f/2.8. It doesn’t have as long of a zoom range as the Tamron, but it makes up for that by costing less than half the price. At $580, this lens is a wonderful value. As our review shows, the Tokina 16-28mm is a hidden gem. While not as sharp as the 14-24mm f/2.8 or 15-30mm f/2.8 at their widest apertures, this lens is a good choice if you want a nighttime photography zoom lens on a budget. If nighttime photography is your primary goal, this lens shouldn’t be your top choice. At 24mm and f/2.8, it’s two stops darker than other lenses that cost far less money (such as the Samyang 24mm f/1.4 or the Sigma 20mm f/1.4). However, a lot of people already own a 24-70mm f/2.8 lens, opening it up as a potential option. If you do have one of these lenses, should you purchase something different solely for nighttime photography? Here’s the good news: with a 24-70mm f/2.8, you can take some very good nighttime photos as-is. 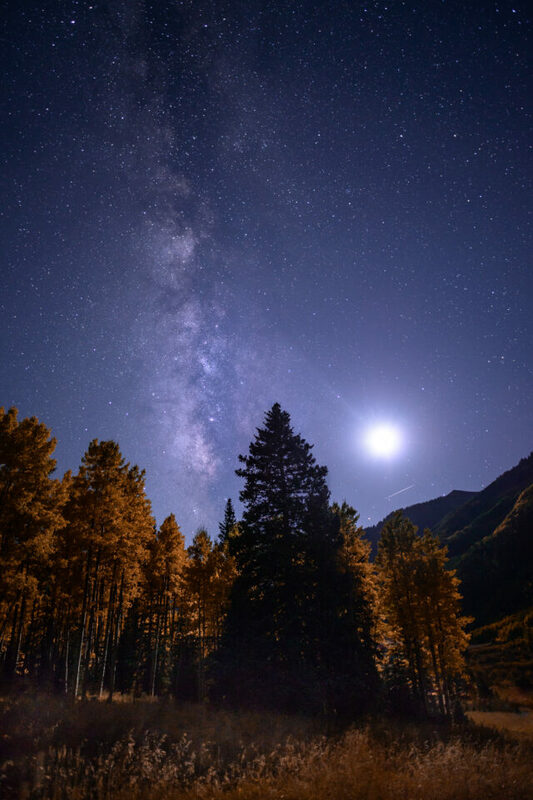 This combination lets in enough light to capture stars that are still bright and clear, and most 24-70mm f/2.8 lenses have low levels of coma. At the same time, if you keep taking nighttime photos, you’ll eventually want something more. Other nighttime lenses either have a greater depth of field (as is true for the ultra-wide f/2.8 zooms) or a brighter aperture (true for most of the prime lenses covered next). There are enough 24-70mm f/2.8 lenses that I won’t go into detail on all of them here. Here are our reviews for the original Nikon 24-70mm f/2.8 and the newer Nikon 24-70mm f/2.8. We also reviewed the Tamron 24-70mm f/2.8 VC. Other options exist from Sigma and Tokina as well. These lenses aren’t ideal for nighttime photography, but, if this is your widest f/2.8 lens, don’t shy away from using it at night; it is still a solid choice that can result in some fantastic photos. This lens is very new to the market, but, at least on paper, it has the right specifications for nighttime photography. At 12mm, it has a huge depth of field, even at the widest aperture of f/2.8. If you want to capture a landscape’s foreground at night, this is one of the best options available. Unfortunately, there are some issues. For one, this lens has noticeable coma – more than the Nikon 14mm-24mm f/2.8 or the Samyang 14mm f/2.8. At $950, it’s also not a cheap lens, especially considering that it is manual-focus only. I think that most photographers will see the price of this lens and pick one of the 14mm lenses below. I certainly would. Optically, the Laowa just is not very good. Of course, some photographers will find the 12mm focal length to be invaluable. That’s significantly wider than 14mm, meaning that you can capture more of the Milky Way in a single shot, as well as get a somewhat larger depth of field. For certain images, that could be the deciding factor. Although the price and coma make this lens hard to recommend, I can see certain nighttime photographers buying it simply because of the incredibly wide angle. This lens has one of the best ISO scores on the market, and, as we found in our review, it is very well controlled for photographing the night sky. Unfortunately, it is a very expensive lens that weighs 1170 grams, more than 2.5 pounds. If you know you need an f/1.8 aperture at a lens this wide, go for it. But, quite often, you will be stopping down to smaller apertures anyway (even 1/3 or 2/3 of a stop) in order to get a bit more depth of field and minimize coma. So, it is clearly a specialty lens. Also known as the Rokinon 14mm f/2.4, this is one of the sharpest lenses we have ever tested for night sky photography (review coming soon), clearly beating the cheaper Samyang 14mm f/2.8, and even edging out Nikon’s 14-24mm f/2.8 (previously the king of sharp night sky photography). It has minimal vignetting and practically no coma, along with a slightly wider f/2.4 aperture that gives about an extra 1/3 stop of light in critical circumstances. It isn’t a budget lens, but, at $800, it is a better price than many others on this list, and it outperforms almost all of them. The only issue is that $800 is still quite a bit of money to spend on a manual focus prime lens, so it is reasonable that not every photographer will find it worthwhile. This Samyang lens (identically sold under the brand names Rokinon, Vivitar, Bower, and many others) is a compelling option. For starters, it has the same ISO score and depth of field as the Nikon 14-24mm f/2.8, since it’s also 14mm at f/2.8. Everything I said about the 14-24mm f/2.8 rings true here – it’s one of the best compromises between depth of field and necessary ISO that you can buy. The Samyang is also $1600 less than the Nikon 14-24mm f/2.8’s retail price, as well as around half the weight. Not bad. The downside, as with all Samyang lenses, is that you’ll have to focus manually. This isn’t an issue for most photos at night, since you’ll have to focus manually regardless of the lens you use. However, it could be a problem if you want to use this lens for general-purpose landscape photography during the day. Although I personally like using manual focus for some landscapes (magnified 100% in live view), autofocus is certainly convenient. For some photographers, in fact, it’s a necessity. Like the Nikon, this Samyang has noticeable levels of flare, although it also has noticeably more coma. It is not the sharpest of wide angle lenses on the market for photographing the Milky Way, although it’s certainly passable. It works very well for photographers who don’t mind a lack of zoom or autofocus capabilities and need a good, inexpensive option. On balance, as a budget prime lens – and even compared to much more expensive options – there’s a good reason why the Samyang is so popular for nighttime photography today. The Irix 15mm f/2.4 Firefly is a well-built lens and very enjoyable to use. It also sells for a nice price at just $425. Compared to the Samyang 14mm f/2.8, it picks up noticeably more stars, particularly in the corners of images, where it is quite sharp. It also has slightly less vignetting than the Samyang 14mm f/2.8. However, the Samyang is less expensive and wider, so it’s a close contest. However, compared to the Samyang 14mm f/2.4, it falls behind optically, both in terms of coma and vignetting (as well as wide angle field of view). The differences aren’t massive, but they are visible. However, keep in mind that the Irix is about half the price, making it a great option for those who are looking for a budget wide angle lens. The Nikon 20mm f/1.8 is another solid nighttime lens – in fact, by the light it allows, this one is almost a stop better than the 14-24mm f/2.8 or 15-30mm f/2.8 options (though it doesn’t have the same depth of field). I’ve used the Nikon 20mm f/1.8 for nighttime photography for about a year, and I’ve found it to be an excellent performer. It’s sharp and has very low levels of flare, making for clean images at night, even when the moon is in your frame. From what I’ve seen, though, this lens has noticeable coma in the corners at f/1.8. I end up stopping down to f/2.2 for some nightscapes, which sharpens things up a bit (at the cost of a higher ISO, of course). I don’t do this for every photo, though; it’s all a balancing act. What makes this lens so appealing is its relatively low price and light weight. At $800, it isn’t exactly cheap, but it’s priced better than almost any other autofocus FX lens in this article. It’s also light enough to carry along without a problem, which is not something you can say of the f/2.8 zooms. If you have a medium-range budget, the 20mm f/1.8 should be near the top of your list. This is a relatively new lens, as well as the one with the best ISO score on this list (which, as mentioned in our earlier article, is a measure of the noise you’ll get in a nighttime photo without blurry stars). In other words, you’ll be able to use a lower ISO with this lens than any other in this article, assuming that you shoot at its widest aperture setting on an FX camera. Since it is the widest f/1.4 lens available for Nikon cameras, this was likely a huge challenge for Sigma to design (which normally would suggest a lower optical quality). Despite that, it’s a very good lens. There is some noticeable coma in the corners at f/1.4, though, so you may want to stop down to f/1.8 or f/2. It’s similar to the Nikon 20mm f/1.8 in this department. The main issues with the Sigma are its weight and lack of a filter thread. This lens weighs almost a kilogram (more than two pounds), which is about three times as heavy as the Nikon 20mm f/1.8. And, if you want to use filters, you’ll have to purchase a large and expensive holder, as well as bigger filters than normal, since the front element of this lens is pretty large. For many people, the Nikon 20mm f/1.8 will be a more practical choice. However, if nighttime photography is your main focus, the Sigma’s large f/1.4 aperture still holds a clear advantage. For photographers who care more about light transmission than depth of field, this is perhaps the best lens available today for nighttime photography. There used to be just one option if you wanted a 24mm f/1.4 lens – Nikon’s own version. Now, there are two others: the Sigma 24mm f/1.4 and the manual-focus Samyang 24mm f/1.4. Of the three, the Samyang has the least coma, which means that you will get the sharpest stars in the corner of your frame. However, the differences aren’t as favorable to the Samyang as you might think; in fact, the Nikon and Sigma lenses are clearly sharper than the Samyang if you aren’t photographing stars (even at f/1.4). The Nikon 24mm f/1.4 lens is one of Nikon’s sharpest wide-angles, as our review covers. The Sigma, though, doesn’t just hold its own – it’s actually a bit sharper than the Nikon version. Although both of these lenses have clear coma at f/1.4, either is still a good choice for nighttime photography simply due to the large aperture. If the coma is objectionable in a particular shot, you can always stop down by 1/3 or 2/3 of a stop. The three lenses are roughly the same weight: 620 grams for the Nikon, 665 grams for the Sigma, and 680 grams for the Samyang. This isn’t enough difference here to worry. In terms of price, though, things are more interesting. The Samyang is $500, the Sigma is $850, and the Nikon is $2000 (though significantly less on the used market). Don’t forget that the Samyang lens is manual focus. That’s fine for nighttime photography, where you’ll be focusing manually most of the time, but it’s not ideal for work during the day. If your only goal is nighttime photography, and price is a factor, the Samyang is a wonderful value. It’s the least expensive lens on this list, as well as the one with the lowest coma. However, if you want to take pictures during the day or with autofocus, the Sigma should be your choice instead (and, other than the coma issue, is a better lens optically). Although the Nikon is a wonderful lens, you don’t need to pay $2000 to get a good 24mm f/1.4, so it is hard to recommend unless you already own it. This lens doesn’t have quite as wide an aperture as a 24mm f/1.4, but that doesn’t mean you should overlook it. In fact, Nikon’s 24mm f/1.8 is one of their all-around best prime lenses for landscape photography, given its light weight and great performance. We covered all this in our review, but there are very few wide-angle primes that match the Nikon 24mm f/1.8’s image quality. For nighttime photography, this lens does have some coma – slightly better than the performance of the 20mm f/1.8, but still not great. However, this is true of every lens in this article at f/1.8. The other problem is depth of field. Although it’s not horrible, a depth of field from 5.4 meters (17.7 feet) to infinity is noticeably worse than other lenses in this article. If you have any nearby objects in your foreground, they’ll be blurry. If you are interested in the 24mm focal length rather than something like 14mm (perhaps for general photography as well as nighttime photography), it is hard not to recommend this lens. Although it doesn’t let in as much light as one of the 24mm f/1.4 lenses, it still lets you use very low ISOs at night. Its light weight and high optical quality should not be overlooked. At this point, the Sigma 35mm f/1.4 has acquired a reputation as one of the best 35mm lenses available today. Although others can potentially challenge this reputation (such as Nikon’s 35mm f/1.8, discussed below), it certainly shows that the Sigma is a great piece of equipment. However, for nighttime photography, it would be far from my top choice. The problem here isn’t the ISO that you can use; in fact, the Sigma’s wide aperture means that you can use a relatively low ISO and still capture a bright image. Instead, the problem is depth of field. At its largest aperture of f/1.4, the Sigma is only sharp in the range from 14.5 meters (48 feet) to infinity (using a very generous depth of field measure, as explained in section four of my earlier nighttime photography article). 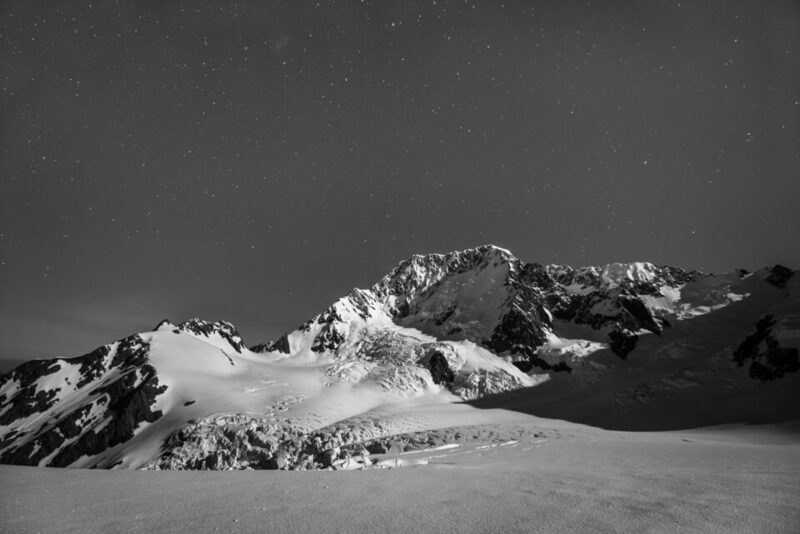 If you’re trying to capture a distant mountain, this won’t be a problem – both the mountain and the stars can be sharp in a single image. However, if you try to include anything in your foreground, it will simply be out of focus. As mentioned earlier, you can always try focus stacking, but, at night, that can be incredibly difficult. You may already own the Sigma 35mm f/1.4, or a 35mm f/1.4 of a different brand. If so, don’t be discouraged from using it for nighttime photos. However, if you’re looking to buy a lens specifically for star photography, there are better options on the market. This is a great lens, but, like the 35mm f/1.4, it’s not really intended for nighttime photography. On one hand, nothing in the photo will be sharp unless it’s 11.5 meters away from the lens (38 feet) or farther. That doesn’t give you much of a foreground. And, since it requires an ISO of 3701, it’s one of the lower-ranked prime lenses in this article. Again, though, if you already own this lens, you certainly can use it for nighttime photography. You’ll actually get relatively clean images; the main problem, as with the 35mm f/1.4 lenses, is depth of field. Unless all of your subjects are far away, this lens won’t let you take particularly sharp nighttime photos. Other options are better if nighttime photography is your primary goal. Crop-sensor cameras – including Nikon’s DX lineup – are not necessarily known for their nighttime photography prowess. They’re about a stop noisier than Nikon’s FX cameras, and they don’t have the same extensive lens lineup for star photography. Nevertheless, you still can capture nighttime photos successfully with a DX camera. The FX lenses listed above, for example, still tend to be good lenses for DX cameras. Something like the Nikon 20mm f/1.8 or Sigma 20mm f/1.4 remains a very good choice. However, some DX-specific lenses have the potential to work just as well, or potentially better. Note: The “full-frame equivalent ISO score” does not represent the actual ISO you should set while taking pictures. Instead, it’s a way to compare the amount of noise to that of a full-frame camera. In other words, you may be shooting at ISO 1600 with your DX camera, but the noise levels will be roughly equivalent to ISO 3600 on an FX sensor. That’s why some of the values below are so high. Again, for more information, read the earlier article on nighttime photography. As a brand, Samyang does a good job creating nighttime photography lenses, both for full-frame and crop-sensor cameras. Their 16mm f/2.0 lens, for example, is one of the most popular nighttime photography lenses available for DX cameras. Equivalent to a 24mm f/2.8 lens on a full-frame camera (in terms of depth of field and the noise in your photo), this lens is a great way to test the waters of nighttime photography. Although it doesn’t quite match the noise performance of a full-frame camera, you’ll be able to capture fairly clean images of the night sky, which is all that really matters. This lens is manual-focus only, which can be problematic for daytime shots, but that isn’t an issue at night (since you’ll be focusing manually regardless). On top of that, the 16mm f/2.0 is a solid value at $420. Combined with an entry-level DSLR like the Nikon D3400, this is one of the most affordable ways to get good nighttime photos. This lens is one of the best – if not the single best – nighttime lens specifically for Nikon DX cameras. The wide angle and bright aperture mean that this lens will give you excellent depth of field at night. The price fluctuates because the brand Samyang goes by several different names: Samyang, Rokinon, Bower, and so on. It also offers frequent discounts and savings. Last time I checked (January 26, 2018), the best value was the Rokinon version at just $353. That’s a steal if you have a Nikon DX camera and want a great nighttime lens, assuming that you don’t mind manual focus. One of the most popular choices for nighttime photography with a DX camera is the Tokina 11-20mm f/2.8, as well as its variants (the 11-16mm f/2.8 lenses). At 11mm and f/2.8, this lens will allow you to take nighttime photos with a large depth of field – something that isn’t easy with most other options. However, in terms of the noise in your final photo, this 11-20mm f/2.8 is roughly equivalent to a 16-30mm f/4.0 lens on a full-frame camera. There’s a reason I excluded Nikon’s 16-35mm f/4.0 from the prior section: It simply doesn’t let in much light as other full-frame options. Still, with DX cameras, you have to relax your standards somewhat. Compared to most other options available, this lens actually works quite well for nighttime photography on a crop-sensor camera. You won’t get full-frame image quality, but you’ll be able to capture the stars and Milky Way better than with most other DX equipment on the market. Think of it as a zooming, autofocusing version of the Samyang 10mm f/2.8 listed above – for an extra $200. This is a very interesting lens, and not one that is particularly well-known. For nighttime photography with a DX camera, though, it ranks near the top. What makes the 14-20mm f/2.0 so odd is its limited zoom range. This lens is only for crop sensors, making it a 21-30mm full-frame equivalent. That’s not much. It feels like Tokina simply could have created a 14mm f/2.0 prime lens instead (saving additional weight and cost), although some people certainly will find the slight zoom to be useful. For general landscape photography, there is very little reason to purchase this lens rather than the 11-20mm f/2.8. With the 11-20mm, you’ll get a longer zoom range at exactly the same price, and both lenses perform well optically. However, if you are interested in a dedicated astrophotography lens, this 14-20mm is a better choice. Its wide aperture lets you use a relatively low ISO, but it still offers a very good depth of field and a high image quality standard. Not a bad lens by any means. As the widest-aperture zoom lens available for DX cameras, it’s no surprise that the Sigma 18-35mm f/1.8 made this list. It is well-known for its optical quality, even at f/1.8, which makes it one of the better nighttime options for a crop-sensor Nikon body. However, if stars are the only thing you want to photograph, you might consider simply getting the Nikon 20mm f/1.8 instead. It’s the same aperture and almost the same focal length, yet costs and weighs significantly less (not to mention that it can be used on FX cameras as well). If you are more interested in a zoom, though, this is a great option. The 18-35mm zoom range is not particularly large, but it’s certainly welcome if you plan to do daytime photography as well. A lot of manufacturers make 17-55mm f/2.8 lenses for Nikon (or 16-50mm, 17-50mm, 18-50mm, and so on). There are worse lenses for astrophotography, but there are far better ones as well. I used Nikon’s own 17-55mm f/2.8 lens for about a year, and I had moderate success shooting some star photos with it. However, you’ll be left wanting more. For astrophotography, 18-55mm f/3.5-5.6 lenses are noticeably worse than the 17-55mm f/2.8 lenses, which weren’t great in the first place. You’ll be pushing your ISO very high (in the ISO 8000 to 10,000 range), equivalent in noise performance to roughly ISO 18,000 on a full-frame camera. Not great. However, if you own an 18-55mm f/3.5-5.6, you can still get star photos – they’ll just be grainier than you may want. Don’t let that discourage you from taking pictures at night. The 18-55mm f/3.5-5.6 lenses will give you a taste of astrophotography, which makes it easy to tell if this is something you want to continue doing. There is no one “best” lens for nighttime photography. Each one has its pros and cons, and different photographers will find some lenses better than others for the work they do. If you want a large depth of field at night, as well as a general-purpose landscape photography zoom lens, the Nikon 14-24mm f/2.8 and Tamron 15-30mm f/2.8 are among the best options available today. Or, if you’re on a tighter budget, the Tokina 16-28mm f/2.8 should be high on your radar. Other photographers – those who want a lens solely for nighttime photography – will find a lot of value in the Samyang 14mm f/2.8 lens. It focuses manually, but it’s a sharp lens that only costs $330, making it perhaps the best value in this entire article. Or, for higher optical performance, the Irix 15mm f/2.4 or Samyang 14mm f/2.4 could be the better choice. At the same time, some photographers will prefer a lens that prioritizes a large aperture rather than offering a large depth of field. If that sounds like you, take a look at something like the Sigma 20mm f/1.4; at its widest aperture, it allows you to take star photos at lower ISO values than anything else on the market. Or, if you want to save weight and use filters, Nikon’s 20mm f/1.8 is another good option. Finally, if you have a DX camera, lenses like the Samyang 16mm f/2.0 or Tokina 14-20mm f/2.0 also can help lead to some spectacular images at night. This article isn’t a complete list (so feel free to mention other possibilities in the comments section), and it already covers twenty lenses! As you can see, there’s no shortage of options for nighttime photography. Even if you don’t have one of these lenses yourself, you should still go out and experiment. It’s fun to take pictures of stars, and you’ll come back understanding which options fit your personal needs the best. Yep you set the meter to 5-10 meter and everything will be sharp from 1-2 meters to infinity. And in that dark there is nothing to autofocus. For night photograhy i don’t see autofucus justified. I agree — you won’t use autofocus at night in most cases. Of course, if you plan to use the lens for more general use during the day, autofocus can be very convenient. Thanks for the excellent summary. I have most of these lenses, but the one I keep going back to for landscape astrophotography is the cheapo Rokinon, especially paired with Sony a7s (can get used ones pretty reasonably priced, as version II has no enhancements of benefit for astro work). During my normal trips (when astro photo is not my prime objective), I use D810A (does fine in daylight in most cases) and Otis 28/1.4 (not a lens recommended just for astro though! ), but the Sony and Rokinon is easier to use. Also, I have found that careful focusing is critical, you can’t rely on DOF. The Sony allows excellent liveview focusing on stars to get precise focusing, while the D810A works in most cases (if bright objects available). Check focus frequently and when satisfied, I tape the focus ring (using a handwarmer pad with adhesives to also provide heat to prevent fogging of lenses if not in the desert). Again, thanks for the excellent article. Thank you, Bob, this is very useful. 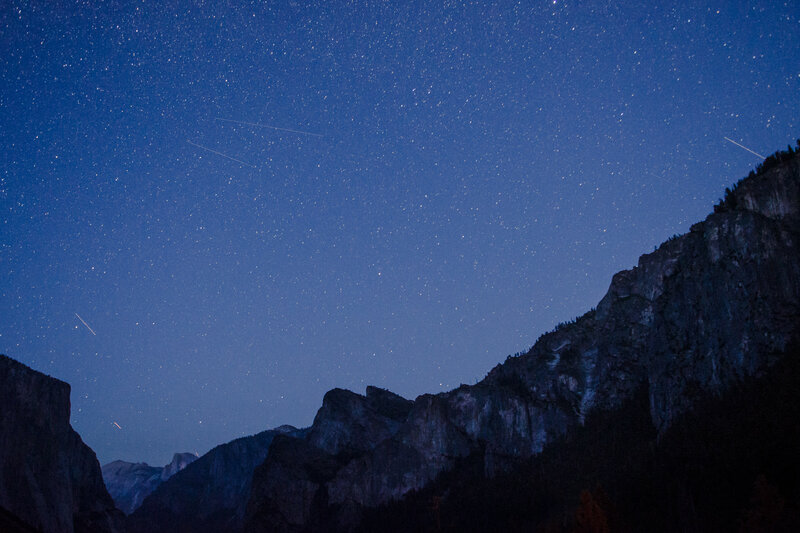 That’s one of the huge problems for nighttime photography — actually focusing in the right place! I’m working on an article that covers it in some more detail. Good tip with regards to adhesive handwarmers; I hadn’t thought about that before. Great article, Spencer. I can personally vouch for the Samyang 14 mm f/2.8 (especially when used with the automatic distortion correction modules in Lightroom or DxO Optics), Nikon 14-24 mm f/2.8, and Tokina 16-28 mm f/2.8, and Tamron 24-70 mm f/2.8 VC for FX. On the other hand, my old Nikon 18-35 mm f/3.5-4.5 (D version) did not perform well at night. For DX sensors, I’ve gotten some good results using the older Tokina 12-24 f/4, along with the already-mentioned Nikon 35 mm f/1.8 (relatively narrow FoV, though). Well done article, Spencer. Have you had a chance to try out the new Irix 15mm f/2.4? I’d love to see it added to this great list. I use Nikon’s 14-24mm f/2.8 myself. Tamron’s 15-30mm f/2.8 VC wasn’t even dreamed of yet when I bought the Nikon, or I’d consider it, however it’s really more of a 15.5mm and that means quite a few more photos to shoot a 360 sphere at night (my specialty), so I’d probably still get the Nikon 14-24mm today. My 1st gen Nikon 24-70mm f/2.8 has a lot of coma at 24mm f/2.8, but I use it occasionally on a second camera body, particularly for timelapse. That is true, the Irix 15mm f/2.4 seems to be a great lens for nighttime photography. I haven’t used it yet myself, but a quick glance online shows that it does a good job controlling coma. That focal length/aperture combination is certainly a good one. In terms of the 14-24 vs the 15-30, I know what you mean. The extra 1mm (or 1.5mm) comes in handy, and I can imagine the difference is even clearer if you do panoramas or 360 spheres. But, what’s happened with probably one of the best, Distagon T* 15mm f/2.8 ? An attendee had a Zeiss Distagon T* 15mm f/2.8 at a night photography workshop I taught last year. It was one of the worst performing lenses of the bunch, compared to a Nikon 14-24mm f/2.8, Tamron 15-30mm f/2.8, and Rokinon 14mm f/2.8. It had severe coma and almost as much vignetting as the Rokinon. It was the coma that was the worst though, almost as bad as a Canon 14mm f/2.8. Being a rental lens, it’s possible he just had a bad sample though. Thanks for your answer, have you any photo for we can see this performance with coma. Other users and photos that i have seen around the web, reffer to Distagon T* 2,8/15 are a brilliant performer. No, it was a client’s camera, lens, computer, and RAW files, and I didn’t put it on my own camera body as it was a Canon mount and I have a Nikon. It really could have been a bad sample being a rental and not knowing the usage history, perhaps it was dropped or abused. It was beautiful during the day for landscapes of course, but the coma for stars wide open was noticeably worse than the rest of the class and everyone was very puzzled and a bit shocked at the poor coma considering the price of a new one compared to say the Tamron or Rokinon. It was also about 2/3 stop darker with the same exposure settings, but that could have been mostly vignetting. If you have one, give it a try and maybe we just had one bad experience with a damaged lens. I’d definitely rent one and try it out before buying. Someday I hope to try out a Zeiss Otus 28mm f/1.4, I’ve read very few reviews on it for night sky. It would be a fun one to rent! I have the Zeiss 21 f2.8 and it’s my favorite lens, but at night, coma is very noticeable. I use the 24 f1.4 and 14 f2.8 Samsung at night. I’m rather surprised the that Zeiss T* 2,8/15 turned out to be such a dud, especially considering its price tag! While I don’t own that lens I do own the Zeiss 18mm, 21mm and 25 mm lenses and I never experienced those types of issues, so yes maybe a bad (which I doubt) copy. I do admit that the Zeiss Distagon T * 3,5/18 does have some serious vignetting issues, but it comes down to experience and practice, ie. knowing the conditions and when and when not to choose it, or should I say use it. Last year in Japan I looked at the Nikon 14-24mm /2.8 and it felt so very cheap, even the plastic the focus ring. There are autofocus lenses and manual focus lenses and they both have their own best fit. With respect to Nikon, I have just one lens, the 24mm f/1.4, and it’s a very nice lens, as long as you use it in autofocus, the throw and precision focusing are just not there using it manual focus. I do wish that Nikon’s AF-S lenses had a longer focus ring movement for more precision, particularly as you get close to infinity. Just a small touch moves the focus a long way. It is very, very well built though, and very well calibrated at the factory. Almost every 14-24mm f/2.8 at workshops has the exact same spot for infinity focus, right to the millimeter. On some heavily used lenses that have been dropped or abused, it can slip a little, but 95% of lenses at workshops are precisely the same spot for infinity focus on the stars. Rokinon on the other hand is ALL OVER the place, often infinity is marked at 4 to 12 FEET. No two are ever alike, LOL! But once you find it, no problem. I thought about including that lens, but it’s hard to recommend specifically for nighttime photography when lenses like the Samyang 14mm f/2.8 and Nikon 14-24mm f/2.8 are so much cheaper and already have wonderful performance. If you own the Zeiss 15mm, though, it is indeed a very good focal length and aperture for this type of photography. Thank you Spenser, great information on night photography. How would my Nikon 16-80 mm f2.8 lens perform mounted on a D7100? I would also love to see an article on shooting mooonlight reflected on water. It’s essentially the same as the 17-55mm f/2.8 lenses — not ideal, but good enough to capture some sharp star photos, and far better than nothing. The last image in this article is roughly what you’ll be able to capture. I don’t have any great moonlight/water shots, but I have seen some that work well. There are a lot of different ways to experiment with nighttime landscapes; I haven’t even covered the tip of the iceberg. What about the Zeiss 15/2.8? I also have the Nikkor 14-24/2.8, and the Zeiss gives better optical quality, in my opinion. If you have the Zeiss 15mm f/2.8, it would be a great lens for nighttime photography. I didn’t include it simply because of the price and high-performing Samyang 14mm f/2.8, but that doesn’t mean it’s a bad performer! I use a Nikon 17-35mm 1:2.8D (77mm filter) on a D700. I use it a lot for low light and wide angle images, and find it performs wonderfully; a stellar lens though heavy. Also a very good choice. At 17mm and f/2.8, you’ll still get a solid depth of field and a bright image. Thanks for adding it to the list. I have a trip to Fairbanks and Chena planned for March. This will be my first night photography and geared for Northern Lights. Are there other considerations for NL vs. Stars? I have a D810 and a D500. Leaning towards the Samyang 14 2.8. I do have the Tamron 11-16 2.8 I can use for the D500. This is great and timely article. I see more astrophotography in my future and welcome any information or considerations based on your experiences. That trip sounds amazing! The Samyang 14mm f/2.8 would be great for Northern Lights photography. Keep in mind that the Northern Lights sometimes move so quickly that, in order to get well-defined forms, you may want to use a shorter shutter speed than normal (even at the cost of a higher ISO). Something like 10 or 15 seconds rather than 30 seconds. Don’t do this for every photo, of course, since you’ll still want some shots with longer shutter speeds and lower ISOs. It’s definitely worth experimenting, though. Good luck! I wonder how the new Sigma Art 12-24 f/4 fare against the rest… I received it 2 weeks ago and it’s absolutely wonderful. Good thought! As an f/4 lens, you’ll have to use an ISO of roughly 5000 or 6400 to get a bright enough image at night. Although some lenses let in more light than that, it’s actually pretty good — and you’ll get a huge depth of field at f/4 and 12mm. Thanks for the wonderful article. But DX users like me will get little demotivated with the limitations mentioned in the article. Hey Kamal, thanks for your comment. I can see how you’d get that impression, but it definitely wasn’t my intention. DX cameras can still take world-class nighttime photos; you just need to be more selective about the lenses you use. 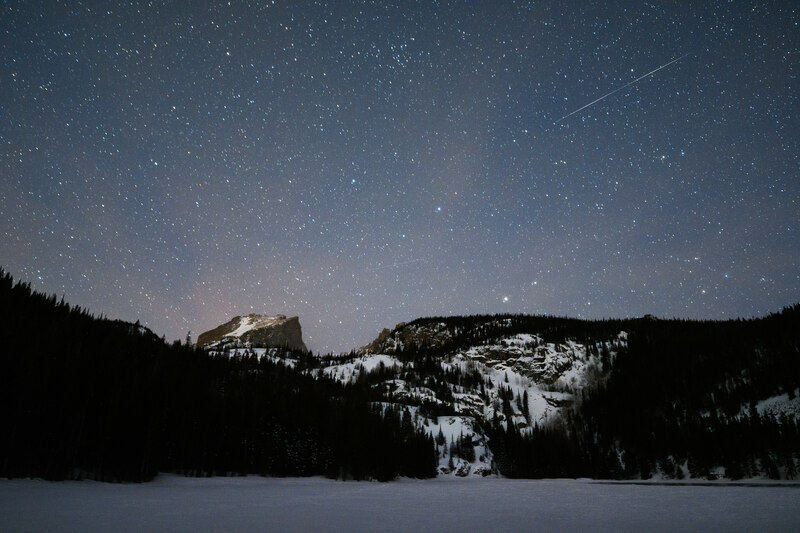 For example, an FX user could capture decently sharp stars with a 24-120mm f/4, while a DX user would find the same lens almost impossible to use at night. Hopefully, though, as the last photo in this article shows, you can still get good image quality from a DX camera! DX and smaller sensors have the ability to take excellent night shots, especially the ones found in relatively recent vintage cameras (roughly 5 years or less). FX sensors just make those same shots a lot easier. One of the biggest improvements in these newer DX sensors is significantly better high ISO performance than older models (example: D60). Although I prefer my FX cameras at night, I’ve also had a lot of luck with smaller sensors. A couple of examples are linked below. In each case, having a good quality wide-angle lens and a sturdy tripod made a lot more difference than the size of the sensor. If you’re not worried about having pinpoint stars (which require shorter shutter speeds, especially at longer focal lengths) you can take fairly low noise night shots at very long shutter speeds. Keep in mind that shots over 30 seconds generally require the use of a cable release. Thank you, Elaine, glad that you enjoyed it! With the Nikon 50mm f/1.4 or 50mm f/1.2, you’re in a good position to take really high-quality star trail photos. The long focal length will make it tough to capture sharp stars without trails, but the bright aperture means that you can get really interesting photos in the 2-10 minute shutter speed range (or longer, if you’re interested). I’ve taken some photos like that recently and have been very happy with the results. As far as the 50mm f/1.2 specifically, I have not tried it, but it appears to have very high levels of coma. It seems like the 50mm f/1.4 will give you better results. However, I don’t own either of these lenses, you should check yourself to make sure of things! some field experience from last 40 years or so. Samyang 14/2.8 is OK optically (though I find it hard to focus) but compared to Nikon 14-24/2.8 I find it definitely almost a full stop slowlier than Nikon, both at 14mm/f2.8 (in starry sky photography). Nikon also does vignet considerably less than Samyang at f=2.8. Same slowlier than indicated f-value is true also with Samyang’2 135mm/f2, which by the way is an exceptionally good lens in astrophotography. Of the 20mm lenses I prefer Nikon 20/1.8 to Sigma’s 20/1.4 solely due to the weight (both have to be stopped down to f=2.8, anyway). With auroras Sigma wins because during a bright displays at their best I have been using 1/3 sec exposures (and high ISO) to freeze the display. In the 50mm lenses a cheap and one surely worth money is the older Sigma EX 50mm/f1.4. I checked it against several Nikon versions (50mm/f1.4) as well as against Noct-Nikkor 58mm/f1.2. Sigma’s EX had “no vignetting” compared to those other 50mm’s or Noct-Nikkor and coma is considerably less disturbing (except when compared to Noct-Nikkor, which, however, is not as sharp in the center compared to Sogma’s EX). Sigma’s new ART is now, however, the winner. If you have (Nikon’s) 16mm/f2.8 fisheye, try it! It works fine and you can increase exposure time a bit; however, coma is not too well handled. But if you happen to have a DX-body and Nikon’s 10.5mm/f2.8, fall in love with it. It is an amazing lens even at f=2.8; nearly pinpoint stars from edge to edge! I encourage to start night sky photography with a kit lens – usually they are very good though ofcourse, too slow for serious nightsky photography. I have limited night photo experience but have been using the Nikon 20mm f2.8 AI-s with good results. I actually like the manual focus, if there is nothing in the near foreground that will resolve in the low light just rack it out to the infinity stop and shoot, no worries. I also really like the smaller size and weight than the new AF f1.8 lens. And you can buy a nice used copy for half the price of the f1.8. It would be nice to have the greater light gathering power of the f1.8, but if you are going to stop it down to f2.2 then there doesn’t seem to be much advantage to the f1.8. However, since I’m still new to night work I’d be curious to hear your thoughts on this lens? I haven’t used that lens, but if it works well at f/2.8 with no coma, it would be a solid choice for nighttime photography! I agree with you. I have been fascinated by the pseudoscience of ‘micro contrast’ aka ‘micro-contrast’ for many years. It started out as opinion-based pseudoscience; in the 21st Century it has become outright anti-science. Everyone who has properly studied the Zeiss and Nikon technical documents, written by their experts in lens design, and made freely available to the public over the years, will know full well why I’ve written this comment. Whereas Yannick Khong et al. will never begin to understand why I’ve written it! So I looked at Yannick’s blog and Flickr portfolio and, whether you like his science or not, it seems to me that he’s able to demonstrate in practice what you disavow in opinion above. IMHO his images show excellent pop and dimension. Surely his lens choices play a role, no? By the way, as you say you’ve “properly studied the Zeiss and Nikon technical documents,” where can all of us see your portfolio showing the benefit of this wisdom? It’d be comforting to ensure you are not just book smart on the topic. Great article Spencer. I need your opinion on DX lenses. I have D5100 with two kit lenses 18-55 and 55-300. I mainly do landscape, wildlife and travel photography. 18-55 is not wide enough for landscapes. So I am thinking of buying a wide angle. Also, what should be my approach in buying lenses – should I buy FX so that I don’t have to replace them when I upgrade (hopefully in a year or two) or I am better of buying DX and worry about FX when I get there? I like that list. However, I probably would get the Tokina 11-20mm f/2.8 rather than the Nikon 10-24 if you plan to do nighttime photography. The focal lengths are very similar, but the Tokina will let in more light (ideal at night). Both lenses work about equally for normal landscapes. Even if you’re upgrading to FX within a couple years, I still think this list works fine. You might consider purchasing the 35mm f/1.8 FX rather than the DX version, but the DX version is so cheap (especially when you buy used) that you really wouldn’t save that much. I would probably use the kit that you listed (though with the Tokina instead), learn which focal lengths you use the most, and then have a better idea of which FX lenses to buy when you do switch. A bonus is that, if you buy lenses used, they have a good resell value. You wouldn’t lose much money if you do ultimately decide to sell them after you switch. Please get your facts right, f2.8 on a crop sensor is the same as f2.8 on full frame, they both let in the same amount of light. Where did someone say otherwise? I couldn’t find a quote. It is of course true that f/2.8 always lets in the same amount of light, no matter the sensor size. So, my sentence would be more precise if it said “in terms of the noise in your final photo.” I’ll update the article accordingly. Ah, by the time you factor in shutter speed differences for sharp stars for the same overall exposure. Hi Paul, thank you for pointing out the issue. Assuming that the problem is the one I mentioned to Aaron, I updated the article accordingly. Hi Spencer, Yes that was it, great article btw. Thank you, Paul, glad that you liked it. I use Tamron 15-30 on my DX camera, Nikon D5300. Does crop sensor and FX lense affect on sharpness and quality? I found that my photo’s sharpness doesn’t perfect. That is a beautiful lens for night photography, FX or DX. If it is sharp during the day at f/2.8 for you, but not at night, then it’s probably your focusing technique. Infinity focus is rarely on the infinity mark for sharp stars with an AF lens. If you use live view to focus on something during the day and it still seems unsharp, then you might have a bad lens sample. may I send to you a raw file and you jodge about the sharpnes? Sure, but I don’t own one to compare directly with, we’ve just had quite a few at night photography workshops I’ve taught and they look very good, on par or maybe even better than my older but more expensive Nikon 14-24mm f/2.8 (though not as wide, maybe 15.5-16mm honestly?). You might want to find someone with the same lens to compare more directly with. Just like Jigar’s comment, I’m looking to buy a wide angle lens to use mainly for travel/landscapes and would love to get some night shots as well. I’ve read reviews on all 3 and they all seem to be good. I know you’ve rated the Tokina quite well, but have you had much to do with the other 2 that you could provide input on? Trying to decide which is the best investment – I was originally looking more at price (the Nikon) but I’m willing to spend a little more if the Tokina is best recommended. Great info on the night lenses for the landscape shooter. I shoot mostly DX (D7200 and D5500) for night sky landscapes (galaxy, star trails, light painting, etc.). With autostitch panorama’s I shoot the Nikon 20mm f/1.8 which allows me to overlap 50% and get great noise reduction processing. Also, the 20mm is = to a 35 on a FX so I keep the shutter at 15 to 20 seconds for better stars. I also find that with the new DX cameras I can push Exposure 1 to 2 stops in post processing and stack photos to get better detail and noise reduction. The benefit of the 20mm is on a DX I can use it at f/1.8 without the problems of coma and other issues like vignette or loss of sharpness on the corners like on a FX sensor. And the depth of field feels and seems a lot deeper at f/1.8 vs a FX at f/1.8. Thus, much easier to get it all in focus. Plus, with 20 to 50% overlap for panoramas, cropping standard aspect ratios are easy without much loss of resolution. And with multi-shot multi-row panoramas, I get more detail and resolution than any single shot with D850. One amazing good DX lens is the Rokinon/Sam Yang 10mm f/2.8. This lens is super sharp, easy to manual focus, smooth operating, and built well. It’s not cheap when you consider the $499 price tag for a manual prime lens for a DX. But, the performance is as good as any Sigma or Nikon. And in most cases it outperforms any DX zoom lens in terms of sharpness and light gathering. But it’s a large heavy lens with no option for screw on filters. But for night sky time lapse it will do a great job. So why DX? I need light weight due to the areas I hike to, and because I use 2 DSLRs. And with Nikon DX sensor technology, I can use manageable ISOs, and still get great results with long exposures not using any in-camera NR. Sure the extra work with panoramas and photo stacking and even layering foregrounds is a lot more advanced, and a lot more work. But the results are splendid, and I like the challenge of pushing Nikon gear to the limits. Great addition to the article, thank you! The Rokinon 10mm f/2.8 is one of the best DX-specific lenses for nighttime photography. Yes, it has the negatives you listed, but I think it makes a lot of sense as part of the kit you describe — a lighter DX combo for photography on the go. Many thanks, Spencer, for the informative articles on lenses for astrophotography. Since you have the benefit of using both focal lengths and f-stop combinations, I was wondering if you could comment on the following choice for an FX sensor. I’m going back and forth on the Nikon 20mm f/1.8 and (probably Sigma) 24mm f/1.4. My main motivation is for astro-landscape photography, but would also likely use the lens for daytime landscape and potentially wide-angle close-ups. My budget only allows for one of these lenses. Any advice or thoughts based on your experiences would be appreciated. They’ll both work extremely well. Just for night landscapes specifically, I always like the look of wider lenses when possible – so, I’d tend to suggest with the 20mm. For more specialized uses like the Northern Lights, I would go with the 24mm – that added 2/3 stop of light will make a noticeable difference. For non-astro work, the 24mm is likely the sharper lens, although not by a wide margin. Both are excellent. The 20mm is also lighter, which is no small consideration. The short answer is that you’re deciding between two of the “best of the best,” and I expect you will be happy either way! Even if I would lean toward the 20mm for astro work, many photographers would lean the other way, and this is down to personal preference to a large degree. Is purple and/or green fringing going to be a problem in astrophotography using the f/1.4 lenses? I have a Nikon 50mm f1/4 that purple fringes badly with bright lights against a dark background. Haven’t tried it yet on a star field, but I don’t have high hopes for it based on the fringing I am seeing. I used to have a dx camera. I have a 10-24 dx lens. What are the advantages and disadvantages of putting a dx lens on a fx camera for nighttime photography? Thanks for the article!! Im having trouble deciding between the Tokina 11-20mm f2.8 and the Tokina 14-20mm f2.0 for astrophotography on a Nikon D7200. One has a wider aperture but the other has shorter focal length so I can hold the shutter open longer with out getting unwanted star trails. Which do you think would give a better astro photo? (regardless of price or depth of field). I am deciding on the Tokinas as I can also add a filter to the front thread for landscapes. Hi. I’m going aurora hunting later this year so I’m looking for a lens for my D5600. Right now I’m trying to decide between the Samyang 10/2.8, 14/2.8 and 16/2 and the Irix 15/2.4. Anything more expensive than that is probably outside my budget. On the one hand, everyone seems to recommend using a fast and wide lens when photographing auroras. The question is, is 10mm at F2.8 more useful than 16mm at f2.0? The faster aperture also potentially allows me to drop down a stop and increase picture quality. On the other hand, from some lens reviews I have read, FX lenses seem to perform better on DX frames than DX lenses do because the edge distortions are cropped out (i.e. reduced vignetting). Which ever lens I buy, I’ll probably keep for later night sky photography. I doubt I’ll every move from a DX to a FX. Although the larger sensor would be nice, the extra weight when I’m travelling isn’t. I owned the Irix 15 and can tell you it is an exceptional lens. The Samyang have serious problem with distortion and I can only use it for nightscape. The Irix is having better performance in that aspect, in addition, you can add your filter in front of or at back of the lens making it more useful in different situation. The focus lock function is also very useful at night and I don’t need to worry about accidentally touching the focus ring and messing up my shot. Last but not least, it is a 2.4 rather than a 2.8 lens. I have a Nikon D750 Camera and I have been using Nikon FX 18-35mm 3.5 – 4.5G ED lens for landscape photography. I wonder if this is a good lens for Night Sky photography? I am going out on a trip to the himalayas, where I believe, we will have good opportunity to shoot night sky images. I can possibly invest in a new inexpensive lens, if needed. Your suggestions / advice would be very useful. The D750 is amazing for night sky photography, the 18-35mm will be a little challenging due to the smaller aperture. Ideally you want f/2.8 or larger, even if that means you stop down to f/2.0 to reduce coma. Starting out at f/3.5 to f/4 is quite dim compared to say a 24mm f/1.4 or a 14mm f/2.8. Have you looked into renting a lens for your trip? Having used a few of these lenses, I found myself agreeing with all those that I’m familiar with. The one missing option that I found in the article is the Nikon AF-S FX NIKKOR 18-35mm f/3.5-4.5G ED – Surprisingly sharp, well controlled coma by f4.5 at 18mm, FX compatible, and about the same weight and price as the 20mm prime. Not a competitor to the top of the list lenses Nikon 14-24 and Tamron 15-30, but still very good performance, and a hell of a lot nicer to take on a long hike. I’m shooting a Nikon D750. I’m looking at the Sigma 20mm f1.4 and the Nikon 20mm f1.8. These two lenses do not feel close to the same. The Sigma is made in Japan and feels solid as well as heavy . The Nikon feels cheap -weighs 2/3 less and is made in China. Is the Sigma sharper in addition to being faster or have you tested it? The Nikon 20 1.8 is sharp and leaves plenty room to stop down. But the Zeiss Batis 18 beats it hands down wide open at 2.8. Anything wider than 16mm will suffer from distortion which means stretched out stars in the corners. What good are sharp stars if they are stretched out. Fast full frame wides are great for low light night photography but once you crop in your stars will bloat and enlarge and not look natural. There are many angles to astral photography but stay within the rules. Find the best lens that’s sharp, with low vignetting, without false color (CA) and distortion. The 2 mentioned lens are great.